During the final days of Advent, the anticipation increases as the birth of the Savior draws nearer and nearer. In the eight days before Christmas this anticipation is marked by something special that happens in the prayers of the Liturgy of the Hours. The antiphons of Evening Prayer (Vespers) during the week before Christmas welcome the birth of the Savior by heralding one of His resplendent Biblical titles along with a special petition in light of that title. It is a liturgical tradition started in the earliest centuries of the Church and continues in monasteries and convents today, and even in homes of the Catholic faithful who make portions of the Divine Office part of their daily prayers. The O Antiphons refer to the seven antiphons that are prayed immediately before the Magnificat during Vespers of the Liturgy of the Hours (or the Divine Office). Each antiphon begins with the exclamation "O", thus earning their popular name of the "O Antiphons." They cover the special period of Advent preparation known as the Octave before Christmas, from Dec. 17-23, with Dec. 24 being Vespers of the Christmas Vigil. 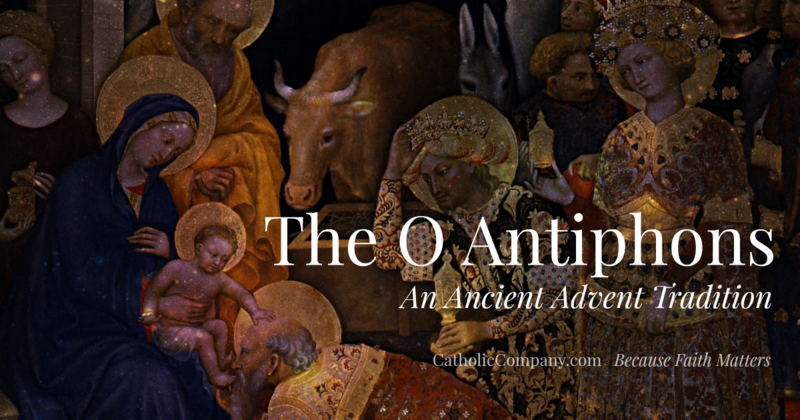 The O Antiphons are special because each one emphasizes a different prophetic title of the soon-to-be-born King of Kings as foreshadowed in the Old Testament by the prophet Isaiah: Wisdom, Lord of Israel, Root of Jesse, Key of David, Radiant Dawn, King of All Nations, and Emmanuel. Additionally, the ancient monks who first assembled the O Antiphons were very creative with the order in which they are prayed. If one takes the first letter of each antiphon (in the Latin) starting from the last to the first, the word ERO CRAS is formed which translates, "Tomorrow I will come." 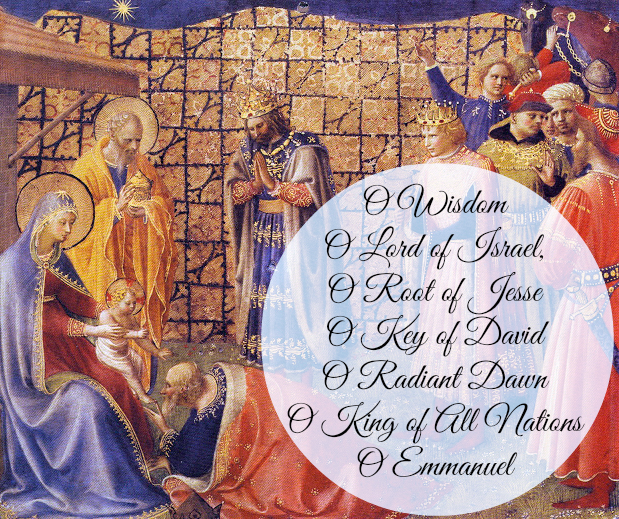 The O Antiphons are also the content of the popular Christmas hymn, O Come, O Come, Emmanuel. For the complete Latin and English translation of the O Antiphons found in the Liturgy of the Hours, the Lectionary for Mass, the O Come, O Come, Emmanuel hymn, and the corresponding verses from Sacred Scripture on which they are based, check out the Roman Catholic Lectionary Website. You can also listen to the O Antiphons in their original context, being chanted in latin by monks, here. Listed below are the O Antiphons, which are prayed before and after the Magnificat during Vespers (Evening Prayer) of the Liturgy of the Hours. 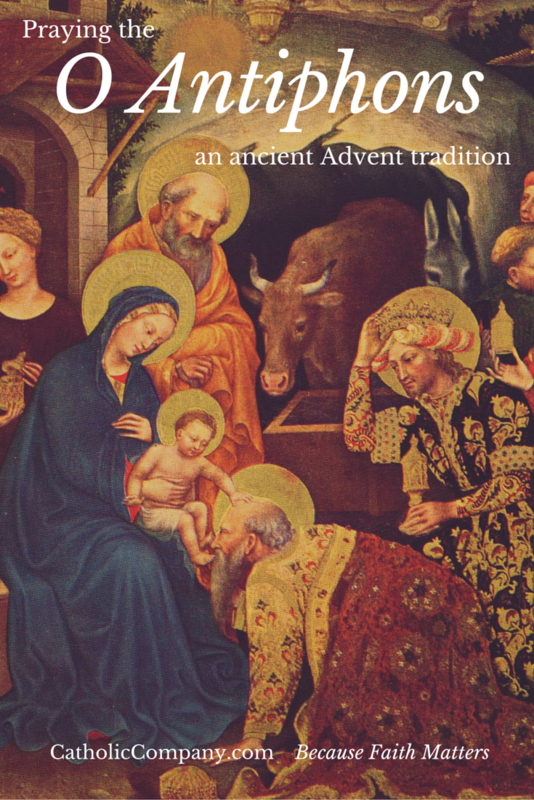 I encourage you to make a new tradition this year to pray these antiphons on the eight nights before Christmas to help you welcome the newborn King. You can pray them by themselves if you are short on time, or pray them in their context of Evening Prayer. You can pray along with the Divine Office daily by signing up for our Morning Offering Daily Devotional Email. Come and show your people the way to salvation. Come and set us free, Lord our God. This article has been updated and was originally published in December 2012. © The Catholic Company. All rights reserved. Beautiful prayers. Could you please send me the liturgy of the hours by email? Gretchen, thank you for this! Such beautiful ancient prayers. I'm going to add O Antiphons to my Advent this year. I was browsing for information on the O Antiphons, found your website, and was amazed that I could get via daily email The Liturgy of Hours. Thank you so very much! Hi Mariana, we do not have this available in an email version. God Bless.